Ontario’s Little Brown Bat, like many other bat species in Ontario, is facing a formidable foe. This foe is the double-headed monster with the disease on one side and wind turbines on the other. The result has been a progressively dwindling bat population. Many people fail to see the significance of this dilemma but the reality is that bats are integral to the maintenance of the ecosystem. Humane bat exclusion techniques can help to keep more of Ontario’s bats alive and in the process preserve the delicate balance of the ecosystem. The Little Brown Bat has been battling the White Nose Syndrome, a deadly fungus that emerged in Ontario’s bat population in 2009. The disease is characterized by a white powdery substance coating the animal’s nose, wings, and ears. The disease throws off the bat’s natural tendencies and has a disruptive effect on their hibernation practices. Instead of hibernating, bats with the disease will fly around and behave erratically. This leads to a depletion of their fat stores and puts their survival in jeopardy. Sadly, for the Little Brown Bat, infection with the White Nose Syndrome often results in death. Bats rely on their knowledge of migration routes and as such reduce their reliance on echolocation, resulting in a failure to detect turbines. Bats keep the insect population in check as insects form a large part of their diet. One bat can consume up to 3000 insects in the space of just one night! Imagine then, the impact of hundreds or thousands of bats. Now imagine how rapidly the insect population can get out of control if the bat population continues to decline. The winged mammals also help to repopulate green areas as they inadvertently drop seeds as they fly. These seeds germinate into trees and shrubs resulting in revitalized and restored green spaces. Unfortunately, the Little Brown Bat sometimes finds its way into human spaces. Many people, out of fear of the winged mammals and ignorance of their critical importance to the environment, employ aggressive strategies to remove them. This exacerbates the problem of a dwindling Little Brown Bat population in Ontario. A better alternative to this is to get in touch with humane wildlife removal services. 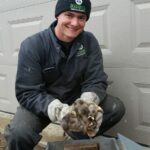 Humane wildlife control service companies like Skedaddle are helping to save Ontario’s Little Brown Bat and by extension our ecosystem. These companies provide a safe and efficient alternative to aggressive and inhumane bat control practices. We also remove and relocate bats safely resulting in a bat free environment for their human clients and preserved life for their bat clients. Humane wildlife control services like Skedaddle will use safe strategies to prevent bat invasion situations. These strategies may include bat exclusion techniques such as the installation of caps and other coverings on vents, chimneys and other potential bat entry points. By engaging these animal-friendly services to handle wildlife invasion problems, citizens of Ontario take the region one step closer to preserving a very important member of the natural population and ensuring that life on planet earth remains sustainable for animals and humans alike. 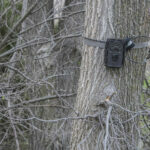 Are Trail Cams Good for Animal Control?